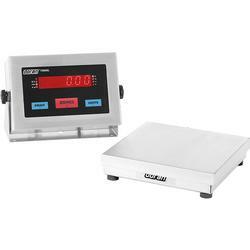 The Model 2200 digital bench scale puts you in complete control of the advanced functions with its intuitive keypad. The easy to use full function keypad allows for simple entry of digital tare, time and date, accumulator, eight product ID's, eight setpoint outpoints and eight grade values. Simply enter the desired value, press one of the clearly labeled function keys and the data is entered, putting the power of Doran's 2200 at your fingertips. An optional barcode reader is available to enter data even faster and more accurately. Connect, control, and communicate to any device or computer with the two standard RS-232 ports, eight standard outputs, two standard inputs, or a wide range of communication options. Connect with our wired Ethernet, Wireless Ethernet, Modbus/TCP, USB, 4-20mA, RS-485 or Fiber Optic options. Control your process with our optional relays that can be mounted inside the enclosure to provide a turnkey solution. Communicate with the flexible and user definable data strings to include tare, product ID and time and date. Send your custom data to a barcode label printer or download it directly to an Excel spreadsheet using Doran’s optional Excelerator Data Collection Program.